From the towering, pineapple-shaped Grand Lisboa to the vast campus of the Venetian, there’s no shortage of casinos to choose from in Macau. The only place in China where casinos are legal, Macau opened up its gambling industry in 2004, spurring the number of casinos to jump from 11 to 32. While there may be a question of where this city’s gamblers like to play, there’s no debating which game is king. 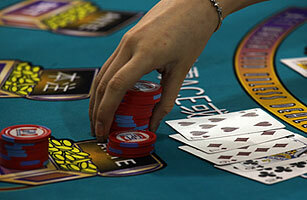 Baccarat, a 15th century Italian table game, contributed 86% of Macau’s $14.1 billion in gambling revenue last year. Still, there are challenges to cultivating a poker following in this part of the world. The WSOP is taking place right now, but most Asians won’t have a chance to watch it. Unlike in the U.S., where the WSOP and celebrity poker tournaments have developed a sports following enabled by ESPN and Bravo coverage, poker is frowned upon  along with other forms of gambling  in some parts of Asia, and many markets ban televised tournaments and any mention of gambling in traditional advertising. In 2007, mainland Chinese censors banned a television commercial for the Altira Macau hotel and casino that featured Hong Kong actor Chow Yun-Fat flipping hotel key cards and ice cubes in an allusion to gambling. Asia might be new to the game, but some of the most famous American poker players are of Asian descent. That includes five of the top 20 World Series of Poker players: Men Nguyen, Scotty Nguyen, John Juanda, David Chiu and Johnny Chan, who holds two WSOP main event titles. Still, without media exposure, these names remain unknown in Macau, leaving organizers to develop local heroes who can inspire the masses to take up the game. See pictures of Las Vegas.